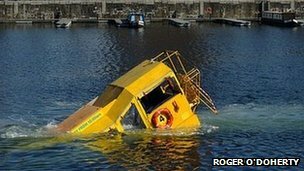 An amphibious tourist vehicle similar to one which sank in a Liverpool dock has been declared safe to take to the water again. 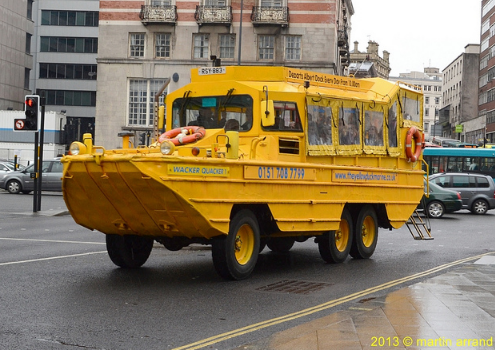 All four Yellow Duckmarines were banned from going into water after one sank in the Albert Dock in March. A Maritime and Coastguard Agency spokesman said the Wacker Quacker 08 craft had been deemed safe to go into water again following tests. He said tests on the others, including the one which sank, were continuing. The World War II DUKW vehicles take tourists around Liverpool on land before ending the tour with a ride in the Albert Dock. One of them started to sink in the dock on 30 March and passengers had to be moved on to a pontoon. Pam Wilsher, from Visit Liverpool, said she was "pleased" to see it back in the water, as it was a popular tourist attraction.